business cards silts are available free of charge. This promotion may be used with other valid promotions (including those found on external websites). gloss, matte and satin coatings are available free of charge. This promotion may be used with other valid promotions (including those found on external websites). Paper 8 1/2" x 11"
Side 1 printed with 2 PMS colors using heavy coverage. Side 2 printed with 1 PMS color using heavy coverage. 80lb White Smooth stock uncoated. This Minnesota natural food co-op welcomes new owners with a clever serpentine design. Farmers and crops sprout out of its illustrated cover. 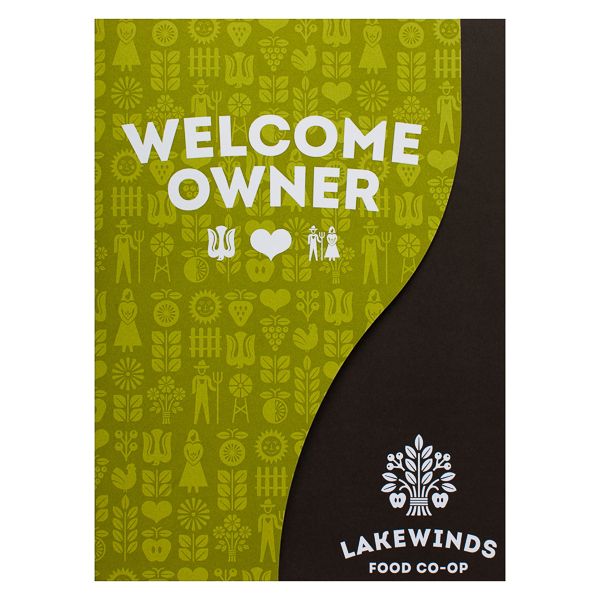 Exposed by the cropped panel, the Lakewinds Food Co-Op logo is visible on the vertical pocket. The black pocket's neutral color contrasts the bright, outdoorsy green of the other panels. Side 1 printed with four-color process and 1 embossed area. Side 2 printed with four-color process. 100lb White Smooth stock uncoated. H1 business card slits on right pocket. 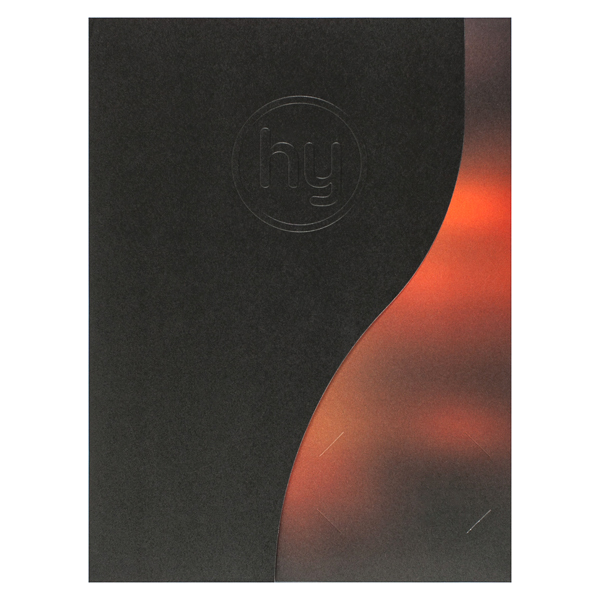 HealthiestYou's embossed "HY" logo blends into the black cover. Its texture creates a tangible interaction for clients of the health and wellness brand, which helps patients locate doctors, learn about benefits, and compare costs. Patches of orange and gray make the exposed vertical pocket look fiery and energetic. Bright orange panels spice up the interior with autumnal colors instead of the medical field's usual clinical white. Side 1 printed with four-color process and 1 foil stamped area. Side 2 printed with four-color process. 16pt C1S White Semi-Gloss stock coated with Aqueous Soft-Touch on Side 1 and Aqueous Satin on Side 2. 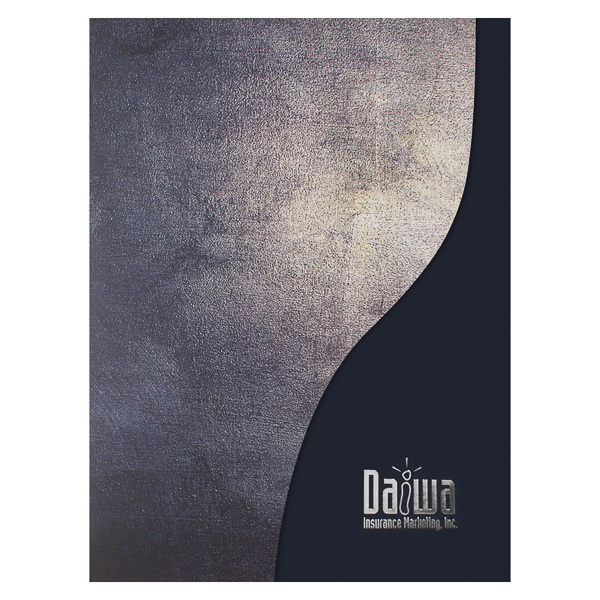 Resembling a stone, Daiwa's cover symbolizes strength and creates the illusion of texture. Its serpentine shape reveals part of the navy pocket; the dark blue and gray panels give off an industrial vibe. The insurance company's silver logo is stamped on the pocket. Its metallic shine reflects light, brightening up the design, and gives the logo a sense of motion. The back panel is printed in navy blue to let the eye rest. Side 1 printed with 2 PMS colors using heavy coverage, 1 embossed area, and 1 foil stamped area. Side 2 printed with 1 PMS color using heavy coverage. 16pt C2S White Semi-Gloss stock coated with Aqueous Gloss. H2 business card slits on right pocket. The HomeMe logo's sans serif font alludes to a modern living space, the script to renters' individuality. Embossed and stamped in Metallic Silver, the logo combines raised letters with shiny foil for an eye-catching cover. The brand colors are especially visible on the interior's teal panels and navy pocket. 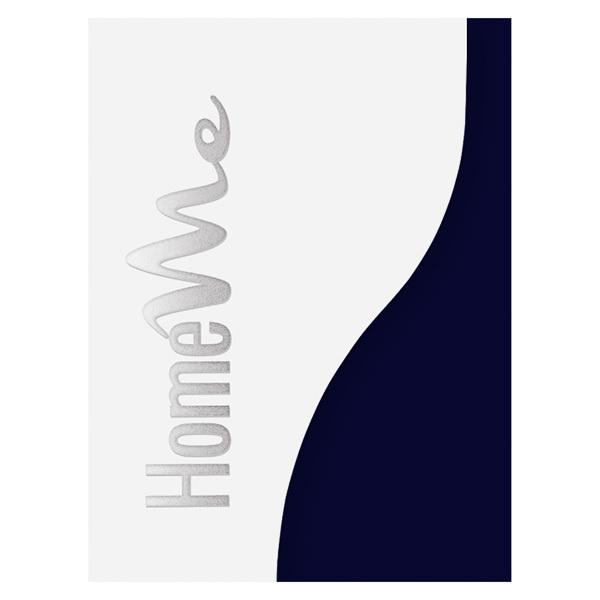 HomeMe's logo is printed in ink on the back panel to reinforce the brand's colors and create a more understated style. Take a walk on the wild side with this serpentine cut cover. The versatile shape stands out in a crowd, whether printed in portrait or landscape orientation. The S-shape cut reveals a glimpse of the inside pocket, enticing recipients to open the cover and see what's inside. The large interior pocket, which is designed to match the front cover, holds 8 1/2" x 11" media with an extra level of security due to its height and increased coverage. Coating: Free of charge: Overall Gloss, Satin or Matte Aqueous. Additional charge: Lamination, UV, Spot and Soft Touch. Dimension Closed: 9" x 12"
Dimension Open: 17" x 12"